Turkey hunting can take you through the complete spectrum of extreme emotions. From zero to hero, then back again. Just when you thought the gig was up, and your opportunity was fading, you connect on the spring gobbler of your dreams. After the high-fives, texts, and immediate calls to buddies are over, and a heaping plate of pancakes has been eaten, you should be thinking about what you’d like to do with your bird. Well before the celebration even, you might consider just how you’d like to preserve the memory, and prepare the meat. The good news is that you usually have a few hours, especially if the weather is anywhere south of the 50 degree mark. Even in summer-like temperatures with an afternoon-killed bird, you’ve got a bit of time to decide how you’d like to prepare your bird. In any scenario, keep him in a cool, shaded place, out of direct sunlight. In most states, you’ve been required to legally tag him by now, but you also need to register that bird for your state fish and game department. This is a crucial, and legal step, don’t forget to do it as wildlife managers rely on self-reporting of these statistics to help determine tag numbers and success rates. If the weather is warm and you won’t have time to process the bird for a bit, at least remove the internal organs by making a small slice between the rear tip of the breast bone and the vent. Reach in with your hands and remove the entrails, being careful to fully remove the heart, kidneys, intestines, and pesky lung matter. Usually the lung bits nestle between the rib bones towards the front and bottom portions of the chest cavity, so it pays to run your fingers like a rake down the gaps of these ribs to pull out all the lung matter. Especially if you’ll be cooking the bird whole, you’ll want this step done well. 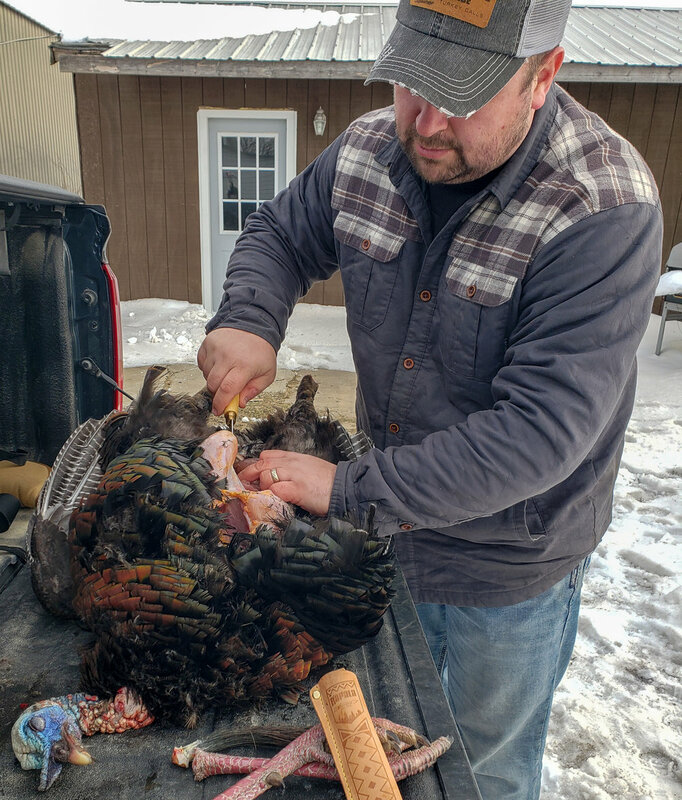 For me, the road forks at “to pluck, or not to pluck.” An adult wild turkey sports somewhere between 5,000 – 6,000 feathers, and if you’d like to roast, smoke, or otherwise cook your bird whole, you’ll get the chance to pull out all of them. I can tell you from hard-won experience that plucking a turkey is never as bad as you last remembered it, and goes quicker than you might expect provided you do so in the “sweet spot”; a period of time that persists one hour after kill time, and no more than 2-3 hours later. Pluck too soon after you kill the bird and you tend to rip the warm skin when trying to pull multiple feathers. Pluck too late, and you’ll find that more of the pin feathers stay with the turkey, making for a poor looking bird with inedible skin. Of course you can always scald a turkey to make plucking go more quickly. This process involves removing the head and wing sections of the bird while you heat a large cauldron of water anywhere past 150 degrees or so. At that temperature, you can soak the bird a good 20 or 30 seconds, but if you use boiling water, a couple seconds in the bath is all you’ll get before you start to cook your turkey. Good kitchen gloves allow you to handle the hot bird and help with maximum feather removal. I’m not a huge fan of scalding the bird, mostly on account of the extra materials and time it takes. I’ll admit it probably does a better job than just my claws alone can, but I can do a reasonable job in quicker time without too much hassle overall. My process for plucking starts by timing it correctly, between one and three hours after the kill, and starts with removing the tail-fan, beard, and spurs for momentos. To properly remove the tail-fan, collapse it and hold near the base above the vent. It’s somewhat independent of the rest of the turkey’s body. Grasp near the base, then slice between the vent and tail-fan base, then down to the backbone, being careful to leave some skin (with feathers). It’s fine to come up the back a bit, as some of the nicest feathers for display come from there. Pull the beard slightly, and cut just behind the waxy and fatty base, leaving just ¼ inch of that trim attached to the beard. For the legs, straighten them, then cut the front of the knee joint and straighten firmly until you feel it dislocate. Cut and remove the entire foot from here. The tail-fan needs some careful attention and fat removal around the base of each feather, and there are some great online tutorials for this step alone. Borax is the preferred preserving agent I use, and feet, beard, and fan each get a liberal dose while they sit and dry atop some cardboard in my garage for a few weeks. Take a little bit of extra time here and you’ll always have options, but do it poorly, quickly, or both and you’ll find that bugs will get the best of your bird. Remove feathers by the neck of the bird working back towards the breast and back. I like plucking up to the wing joint before removing it. Straighten the wing, then cut the webbed skin toward the open part of the joint before breaking it by hand. From here, the knife does the rest of the work to fully remove the wing. Continue until all feathers have been removed, and have a goal for this thing to be as pretty as a store-bought bird. Remove any bird shot just below the skin, and if you haven’t already removed the entrails, do so now. Lots of clean water is now required to wash your bird, inside and out until it runs fully clean. If you have the opportunity to put it in some salty water and refrigerate overnight, it’s a good option. My mother always preferred this with poultry and usually the salt both drew out blood and slightly brined the meat. Of course you’re not required to pluck a turkey. Especially when I’m traveling to hunt, it’s simply more convenient to pull back the skin and slice out the breasts. The innermost portions of are the “tenders” and have a long, sinewy tendon that starts up near the wing joint and continues through the length of it. I like to leave that tendon connected to the bird and slice the tenders off of it, both sides contain some of the choicest meat on the bird. These are prime candidates for immediate cooking. The legs come out easily by splaying them outward to dislocate the hip joints, then cutting between and down to remove the whole leg and thigh portion. Whole birds I wrap in freezer paper (several layers), tape up, and label well for the deep freeze, while breast meat I like to put in two layers of freezer bags. Remember to label well if you are freezing, as different cuts deserve different treatment. Breast meat cooks up very well, though definitely benefits from a brine of any sort to help retain moisture in the meat and add flavor. The leg meat works really well when braised, especially in a crockpot. Whole birds smoke very well, and can be roasted like your Thanksgiving turkey, but again, benefit from a stint in brine and continual basting. If all of this sounds like a lot, it can be, but the trick is to keep grinning. Realize you’re among the lucky few who get to tag one, and take your time as you enjoy the process. Open patches of ground were key to taking this turkey, as they provided the best feeding areas for this gobbler’s hens. “Birds of a feather flock together” has a figurative meaning, but in regards to early spring turkey hunts, the phrase applies in a more literal sense. Across the country, if you’re hunting early, you’re more often than not hunting groups of birds rather than individual toms. That’s especially true in years where unseasonable cold and winter weather patterns stretch far into spring, pushing back the breeding season and putting more state hunts into the “early” category. Sure, you’re hunting birds that haven’t seen a decoy or its owner since last year at the earliest, but you’re also facing the hardest competition of all, and that’s a live hen. In the event of a late spring, mother nature applies extra pressure to pack in as much breeding activity when more favorable weather does come, making it that much more difficult to go against the real thing. For those reasons or more, you need a set of strategies to deal with the 80/20 rule, being that the majority of the turkeys are bunched-up in a very small part of available habitat. First and foremost, you can’t kill a turkey where they ain’t, so the value of scouting is dramatically more important early in the season compared to late. In the latter portions of the season, forlorn gobblers are wandering aimlessly, looking for the last hens of spring as the majority have been bred and are sitting on nests. Striking up a conversation then with a random bird is easier as they’re looking for you, whereas early, most toms have already found what they’re looking for. Not all scouting is created equal, and especially with changing weather patterns and a rapidly progressing breeding season, the freshest information is best. While it’s good to have a flock located, along with a “Plan B” property or two to fall back on, the few days and hours directly before your season will provide the ultimate in actionable intel. You’re not just looking to find out what fields or openings these big flocks are working, you’re getting there early and keeping your distance, scouting with optics preferably. It’s difficult to beat multiple sets of eyes, and you want a vantage of the entire operation to see how the entire organism moves, retreats, and flows from one area to the next. You want precise information, like field-edge openings, funnels, and specific fence-posts or trees that the majority of birds move past. As you hunt birds in these fields, even old pros of the turkey woods are well served by some sort of blind to conceal movements. Big groups are notorious for enveloping your position, as hens or jakes abound within range before picking you off, while the toms stay just outside of what it takes to put them down. In a blind, you have some flexibility to move, throw your calls in differing directions, and the ability to use scratching, hat-flapping, and other high-movement type calls you’d never be able to get away with out in the open. In the north, a blind will also handily house a small propane heater, something that may be a requirement for a sit of any length during the early youth seasons. Perhaps the best part of this type of hunting early season, is that you’re going to see birds. Setting up in a well-scouted open area, where you are likely to see birds throughout the day, offers some unique insight into a turkey’s world. So much of what I’ve learned about calling, specifically what types of calls to make, and when, comes from the lessons learned huddled inside a blind as birds work all around me. So often we focus on gobblers and how they interact with your calling, how they decoy, or ways to best hunt them overall, we miss out on how much hens really run the show during the early part of the year. A lead-hen’s stomach, and the patterns she finds most convenient or safe, will often determine the manner and location of your hunting during the early season. From there, even if you’re in the right place at the right time, calling too aggressively or during the wrong time can have you shunned as a wise-old matriarchal hen leads her group of turkeys, gobblers and all, in the opposite direction. Flock talk then is of the utmost importance. Soft contented clucks, with some check yelps and purrs mixed in are the order of the early spring, especially with birds in sight, as you’re trying to mimic a group of feeding hens to fool the live hens, not an upstart jenny looking to steal toms. Field hunts can also be frustrating, sometimes taking you so close, yet still too far. For that reason, you also want roost locations, and not just general information, but specifics down to which trees the toms will favor vs. the rest of the flock. Keep in mind, it’s a dangerous play to be anywhere too close to these locations in-person, both scouting and hunting, but if your field or strut zone play is a low percentage one, your best bet is often to get on them right from the roost. With early being the order of the season, think about getting within 100 yds of the roost a good hour or more before first light, minimizing your chance to spook birds. Cover is sparse early, so use your own best judgment on exact distances, but keep in mind that you may be hunting this group throughout the season, so it’s often best to stay conservative. Depending on how tight the toms roost to the hens, try to get near a reasonable landing zone or just off of it while putting your back to those hens. Avoid overcalling and hanging a tom on the limb, offering him just enough to drop out of the tree and hunt you down, without keeping him up on the branch while waiting for all the hens to fly down and saunter up to his roost tree. Whether your move is a field-edge or the deep woods right off of the roost, early birds will test your patience and require you to hunt the hens just as much as the toms. If all else fails, see what you can do to get that lead hen talking. A loudmouth lead-hen has been the downfall of many a great tom, and do your best to mimic her. As her frustration and volume grows for the home-wrecker jenny you’re imitating, step on her calls and cut her off a few times. While it can be a last ditch effort, it’s often the deal-maker on a tough-hunting flock that won’t move any way but away from you. I stand at my grandma’s place in town, with cousin Todd Heinrich and the first bird we took in 1996. My introduction to turkey hunting did not play out like the fairytales you see on so many TV hunts these days. I didn’t luck out on my first sit, or have someone that dropped me in a blind and called in a bird for me. I was 14, and all I knew about turkeys came from some deer stand observations the previous fall. The results showed, with my first 3 years being completely unproductive, at least in terms of harvesting a bird. At that time, I wasn’t always lucky enough to draw a license, and the only tagging I did was tagging along with friends and family as they struggled through the learning process as well. I’m thankful for those failures however, because the impact of our first then left an indelible mark. It was a defining moment for me, and more importantly, a hunt that continues to teach, as have many of the hunts I’ve journaled over the years. Some are more memorable than others, but each one has lessons embedded deep within the story of that experience. 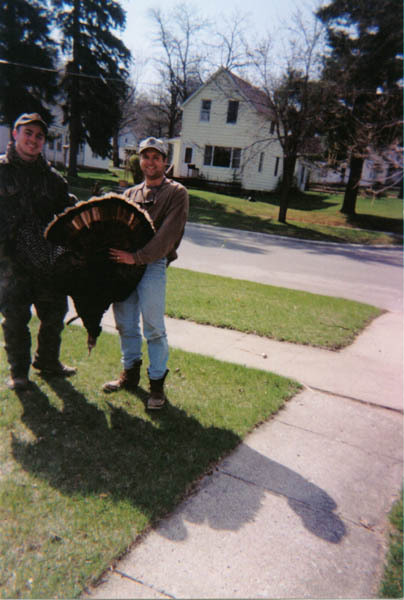 This article describes the first in a series of hunts that changed the way I think about turkey hunting, and shaped my strategies and tactics forever. I knew calling was a “big-deal” in turkey hunting, as the few resources that were out there in the early 1990’s made heavy mention of it. That, and most calls you purchased at the time came with an instructional cassette tape. I couldn’t blow a mouth call well, but a slate was easy enough to get both good sound, and a number of different turkey vocalizations out of. Still, against my ear, and that of the turkeys, I continued to beller and blast ridges and valleys with the poor sounds of a diaphragm. I remember the sound being more similar to an upset goose than any self-respecting hen turkey, but I persisted nonetheless. Faint and far off gobbles was all I’d ever hear while hunting multiple days that first season. I never saw a bird, and what hearing of them I did could’ve been shock gobbles more than an interested tom anyway. Year 2 was far different. I cut my teeth, and found a way to blow no less than 10 separate chances at toms. It was an embarrassment of riches, at least from the perspective of the sheer number of birds I contacted. They were everywhere, and I was terrible. I had one bird come from the top of a ravine all the way to the stream and valley floor below, many hundreds of yards straight to my calling, only to hang up on downed brush throughout the pasture I was sitting in. I had another bird literally rush me as I was setting up along an open field edge. Still another I hung in the tree 40 yards from me as it gobbled at every noise I made, before making me, and flying down the opposite direction. If there was a way to mess up a bird, I became good at it. Yet I was seeing birds, and even attracting them to my position, getting better and better with that mouth call as I heard hens wake up around me and go about their daily business. By the latter part of my third season, I’d seen a few tricks that birds can play, but never had that magical moment where a bird strutted across a wide open space, lured to the call as if entranced. That is, until a fine April morning in a steep-sided pasture of grass and cattle. The birds roosted in a ravine through which we had to sneak, early enough so as not to wake them. That left us in fine position at the upper end and head of the pasture, as birds sailed down and out of trees to the bottom corner of it. They had no interest in us, and proceeded to work in circles throughout the lower end for nearly an hour. They chased each other, strutted, gobbled, fought, and ate. Truly it was an incredible sight as cardinals boomed, and the sun eventually cut back the haze hanging throughout the valley. Every few minutes or so I offered a couple yelps, to no avail, as birds eventually worked further down the valley and away from us. At least until I broke out an old slate. Cheap plastic in construction, with a soft but hollow sound, it certainly didn’t sound good to my ears. To a young tom that day in 1996, it was the best thing he’d ever heard. Eager to put on a show, his first move was to reveal himself, 150 yards below us, emerging just from the timber to dance and gobble without approaching. This kept on for long minutes, though by now I was learning to shut up as much as call. Patience came harder to me then, but over the course of the next 30 minutes, I’d watch him continue his processional in a two-steps-forward, one-step-back type of march. Up the hill he came, quite silently save the intense “pffffffffffffffft, vvvvvvvvrooooooom” sound I’d later come to know as spitting and drumming. It took an eternity for him to reach the 30 yard mark, and the Winchester pump that poked between the top two strands of barbed wire rang throughout the valley. It was this bird’s end, and my beginning. It was an “aha” moment for me as a hunter, and a student. When something clicks like that spring morning did for me, it sinks into your grey matter and leaves you wanting more, making you anxious to learn more in the process. That bird hated the “better” sounding call, favored the “poor” sounding one, and even then approached in a cautious, measured manner. The more I’d call, the harder he’d strut. Luckily for me, I believed that call sounded bad, so I used it far more sparingly than the one I was more confident in. As long as he was coming my way, I wasn’t talking, and it made all the difference. So did our early approach. Hanging a bird in the tree on that same ravine roost the year previous reminded me of that. It was the first in a number of landmark hunts that I’d like to share with readers, as each was a complete breakthrough for me and the way I approached the sport. I’m guessing that many of you who’ve hunted them a few years have had similar experiences. It’s these hunts that continue to mold our hunting future, often for better but sometimes for worse. The amazing part is that no matter how many states I’ve hunted, weapons I’ve used, or turkeys I’ve taken, I still have these hunts from time to time. Most recently, a Wisconsin hunt last season, again forever changed the way I’ll look at field birds. More on that story to come, and until then, break out your turkey gear and think of warmer days and gobbling turkeys. New heavier-than-lead loads like TSS put more pellets in a 10" circle at 40 yards than any lead I've ever tested. Knowing your effective range by patterning and pellet-counting helps settle one of the toughest calls as a turkey hunter you'll ever have to make. In the course of even a single season, turkeys will challenge your skills and make the most confident hunter into a wuthering pile of loathing and self-doubt. Each day presents new scenarios, culminating into a number of “tipping-points” that we inevitably look back on with the clarity of 20-20 hindsight. Here’s a number of those very situations, along with some advice on how I’ve learned to best handle them throughout the years. To Call or Not to Call? – You’ve just made a string of yelps and everything in the woods is white hot with excitement. It’s one of those rare days where you can simply do no wrong, and they’re picking up every call you’re putting down. Then the other boot drops and silence abounds for 10 minutes or more. Do you call again? If no, then how long to wait? Well my experience has been that sudden pauses in calling are either really good, or really bad. Birds have heard what they needed and are on a straight-line march to your location, soon to appear at any time. Or, they’ve been spooked by another hunter or coyote, they’ve flown down and left the audible area with hens, or any other act of tom-foolery. Birds that are still gobbling occasionally give you clues and cues to go off, and there are no general facts for when and when not to call. That said, the closest thing to any hard or fast rule that I have is not to call to any bird that is closing the distance to your location. If he’s coming, don’t call and screw it up! Should I Stay or Should I Go? – So often we’re presented with the choice to give chase to birds that are leaving the vicinity, or hold off and wait. To answer that question, I’ll first think to what other options I have should I pursue and spook. If you only have 40 acres of access for the season, it’s best not to get too aggressive. I’ll also think to what other birds I heard in the roost, doing my best to identify how many potential toms heard my calling. I try my best to wait out any play for 30 minutes after last call if I really got agressive, especially if birds are responding from out deep. There’s a few exceptions to that rule, but for the most part, I’ll get to the point of almost standing up, then give it another 5 minutes. Edge of Range – Just writing it makes my skin crawl. I can’t begin to tell you the number of birds that have skirted the edge of my weapon’s effective range over the years. I can very precisely tell you the handful of times I’ve been tempted to push the limits, and let’s just say that it works only occasionally. You can’t tempt the limit till you define one, so your early season patterning is more than just a fun time at the range, it’s crucial to drawing that line in the sand. If I can’t put 100 pellets consistently into a 10” circle, then that range draws a distinct line for me to shoot within. If that distance is 50 yards, 51 yards is flirting with disaster accounting for wind, brush, sore arms, and any number of variables that don’t play out in the field like they do on a lead-sled. These birds deserve more than “occasionally” so I use a rangefinder where legal, and able, to demarcate a zone that I simply won’t shoot past. When to Shoot? – The bird has finally crossed into the death zone, and you’re just waiting patiently for the best possible - can’t mess it up – shot to present itself. Don’t wait too long, or really at all. My best advice has always been to take your first, best shot as soon as the bird is in range. Of course a bird in the wide open with his head down slowly walking your way poses little threat of escape. Add cover, other birds, partial views, and a tom that’s already nervous, and you’ll find how remarkably possible it is for a tom to sashay into range and out of it before you ever get to pull the trigger. That’s why I’ve killed so many birds between 35-45 yards. It’s not because I like pushing the limits of my equipment, but it’s because far too many toms have wandered into “sure thing” setups, only to find a wide tree, hen, or blocking fence-line to walk straight away and in line from, thus preventing any shot. Fall back on your patterning, and take the very first, best-looking shot you’ve got while the bird is in range. Brush Birds – See above, then take your best shot even if it involves a few twigs. With a caveat. Know that I’d never promote someone taking an unsafe shot (not being sure of target or what’s behind it) or a shot that would potentially maim a turkey (too much brush), but a swarm of pellets especially well inside of your effective range does wonders for peeling back a few sprigs of spring. On the other hand, if you’re looking at a bird in the brush for which you cannot identify the beard or exact location of his head/neck area, then it’s far too thick to try. My rule of thumb is to clearly identify the outline of the head and neck area and make sure you can see beard, then squeeze off a quality shot. If you’re shooting at the outline of a turkey itself or at the edge of your effective range, you don’t have a prayer. The truth, I’ve learned the hard way over the years, is that calling in a turkey can be as much about what you don’t say, and when you don’t say it than any kind of fancy forlorn calling sequences. Most close calls and successful hunts have a turning point; the part of the conversation where a bird comes near, but is still too far. At that point, critical decisions are made that more often break the hunt than make it, and so often the offending party is your calling decisions. Often they’re made too hastily, as a frantic last ditch effort that never had to be uttered. Ever hunted with a buddy as they’re questioning your calling? “Hit him again” or “get on that box call” or “he’s walking away” are statements uttered as a matter of nervousness on the hunter’s part, more than they are as direct observations of what the turkey’s behavior is telling us. With a bird that’s out of sight, we rely primarily on our sense of hearing to inform us, making the waiting game that much more challenging. Keep in mind that the bird often can’t see you either, and with each call he’s tightening your noose as a shrinking circle of certainty with which he has you pinned down. When he knows exactly where you are audibly, he doesn’t need to confirm that fact visually, further strengthening my own personal rule of not calling to a bird that’s actively closing the distance. So often, birds that “hang-up” are “hung-up” by hunters who call to a bird that’s walking right at them. For birds in field or other open situations, it gets even more difficult. A traced path of any tom’s death march to the end of a gun barrel is full of jagged edges and zig-zags, especially if they’re strutting. As they pirouette, gobble, and walk, toms rarely head straight to you, even with decoys clearly visible. It gets almost too tempting to call at them when they’re spinning away from you, side-stepping, or otherwise not directly gobbling into your blind. The trick here is to enjoy the show, and through time and some experience, learn to read key clues on when they’re actually coming or going. The double wing flip, observed as any turkey folds one wing back, and shortly thereafter another means one thing for certain, the bird will be taking a few steps. Hasty double wing flips, followed by a sharp angle away from you is a harsh reaction to something, while that same body language in any direction quartering or directly at you is a really good thing. Let the scene play-out, and realize that these birds may need some time to get comfortable with the thought of approaching. If the best time to shut-up is when a bird is approaching, the next best time is when your calls continue to fall on deaf ears. Birds that gobble actively, just not at you, are telling you something without saying a word. They’re not liking something about your calling, whether it be cadence, tone, or frequency, or at the very least they don’t like the direction or area it’s coming from. Try changing up your calls, your calling, or your location to see if you can’t elicit a better response. Another great time to bite your mouth call, is when feeding birds are marching across an expanse with cool and calculated determination. So often they’re heading to a hole in a fence or following a topographical feature like a natural drainage path. This is valuable information too, and if you can sneak around and out of sight to the area they’re heading, you’ll be ahead of the game. Even if you don’t get to their exact destination, the easiest turkey to call in is the one that already wants to be where you are. You’ll be amazed at how much more receptive they can be when you’re nearby or just past their area of interest. Of course, I don’t mean to take away the fun of calling, as it really is one of the joys of turkey hunting. Learning to use it judiciously, and most importantly knowing when not to utter a sound, could be the best call you’ve got.